For those who don’t know this awesome spot, it’s underneath the east side of the Palm Valley bridge on the intracoastal where Palm Valley Outdoors is (or if you remember the restaurant Under the Bridge…that’s where it is). Everyone is invited. There will bands, including guitarist Nick Marino, a kid play area, a large movie screen featuring the old Willy Wonka & the Chocolate Factory, and of course, FOOD TRUCKS (eight to be exact). The initial event on June 26 drew over 1000 folks – old, young and everyone in between. 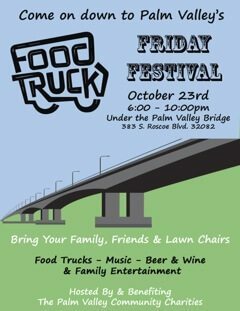 The Palm Valley Community Charity, Inc, has worked closely with the Palm Valley Community Association’s Events Committee on this event.